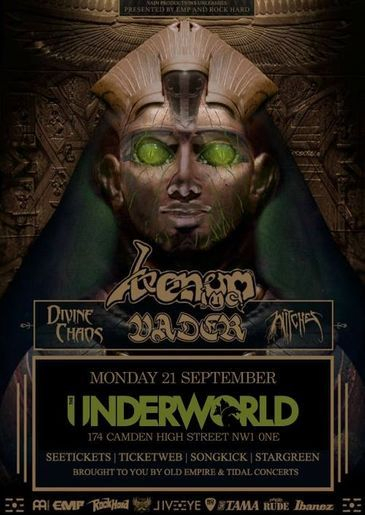 VENOM INC, VADER, DIVINE CHAOS & WITCHES: MONDAY 21ST SEPTEMBER 2015 AT THE UNDERWORLD, CAMDEN, LONDON. Firstly, when I heard about this line-up, I think it safe to say your expectations of such a gig is very high. Two incredible respectable bands Venom and Vader supported by some great sounding bands in terms of thrash and heavy music. So first up a band called Witches. When you stumble across a band that have an inviting sense of brutality and are also female fronted, not only are you excited because it is very rare these days to have a vocalist that can blast out a powerful voice but also you are pleasantly surprised as it is well backed up by the compact shredding that encompass the band as a collective unit. Witches have that factor where by you can easily see that they are fast and furious but have their own stamp in the area of thrash and death metal. Divine Chaos are a band that have the buzz that feeds the ferocious energy you have inside of you and demands you to listen. You can see dynamics of Testament and throw in a bit of Exodus and put that together with early albums of The Haunted and you have the grounding works of Divine Chaos. Imagine bleeding it all together and creating something unique and fresh but keeping within the boundaries so it doesn't sound like a watered down diet coke thrash band you come across these days. You can absolutely see why live these guys have material that will demand the attention of the audience to bang their heads unashamed. An absolute homage to thrash metal. Next up we have the mighty Vader. Let’s look at the history of Vader first of all. A well respected death metal band that have not just created albums over the years but they have been a band who have produced quality, precision and brutal music which was delivered to the audience right from the word go from the first song. Listening to songs from 1985 ranging through to t990 it was a pleasure to witness such a set. The energy is what captures Vader live. They have the ability to evoke what they play to the spectator and the response was the unleashing of a great mosh pit. Death metal fans were in for a treat for this evening as Vader came, they played, they delivered and the outcome, a brutal display of power. Incredible set. Not very often can we say we have the original members of Venom from the early albums performing London in the band which is known as Venom Inc. What a privilege to have been asked for an interview but also to have the band performing in London at the Underworld in Camden. Straight away there was an anticipation across the room to see what this set would bring to this show. As soon as the band entered the stage, you could see fans from all walks of life here in this room committed to see this band. Opening track "Prime Evil" went down a storm and instantly the music filled the air and nostalgia from Venom’s earlier albums hit the room. What a great opener and soon followed "Die Hard", and one of my personal favourites after “Don’t Burn The Witch” and “Live Like An Angel (Die like a Devil)”. Fantastic choices of the songs allowed it possible for the audience to be in a state of moshing bliss in a frenzy of metal fans across the room, moshing and stage diving. The more reserved even at the back could not help but shout out the words to the songs and have a sneaky headbang. That’s when you know you are touching people and bringing out their natural passion for Venom’s perfectly orchestrated songs. I haven’t seen Underworld packed like that for a while now. Simply listening to the legends that have inspired so much black metal and heavy music during the years was exciting, humbling and inspiring because to hear and witness such a magnificent set was indeed an incredible moment. Next up was One Thousand Days In Sodom, Warhead, Buried Alive, Raise The Dead, Schizo, The Seven Gates Of Hell, Sons Of Satan, Bloodlust, Warhead. Then just when you think it couldn't get any better, the last songs of the set was my favourite, Welcome To Hell, Black Metal, Countess Bathory and ended on Witching Hour. Magnificent! Venom Inc engaged the crowd, they provided great showmanship and thanked the fans, the media and everyone who had supported them. They displayed great stage presence and provided a great energy on stage and I think to any Venom Inc fans, this was a show worth waiting for. Venom Inc, satisfying, electric, keeping the old school alive and damn right brilliant. A real honour to witness such a show. 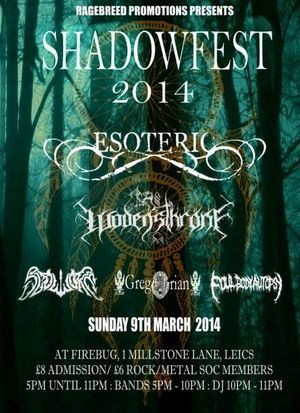 A very varied and interesting bill this evening and it was my intention to bring Leicester a taste of the underground which I believe Shadowfest 2014 did deliver. First up we had homegrown progressive one man band Foul Body Autopsy that delivered a precise and entertaining set although the main crowds did not start arriving until a bit later. 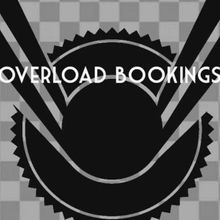 However always on form delivering dynamics and yet such precision on the heavy yet forward thinking approach of progressive music. Death vocals and a real feel for a technical collaboration of sincere brutal force yet coupled with elements which makes Tom absolutely entertaining to watch and enjoy. Greg(o)rian were on next. Crushing doom at this finest and had a real sense of musicianship on stage and delivered a powerful set. These guys have a so much potential to really make a name for themselves as their sounds consumed you in the depth of your gut, produced the atmosphere and also allowed us to feel that dirgy goodness that we crave leaving us with a feeling of wanting more. I am looking forward to hearing more of their stuff. Next up a band that has been creeping up in the UK as a very recognized doom band. Slowworm are a work of art. You can certainly see the "Patrick Walker" influence (Warning, 40 Watt Sun) and the progression of emotion in such a vastness you are automatically engaged to feel without consent. They have a strong set and absolutely gave a good show. Tight, inventive and thoroughly enjoyable to watch. Next up we had the mighty Wodensthrone who blasted out their quality black metal with the yearning atmospheres of bleakness that draw you in and out of despair, anger and woe. A great impact they made when they hit the stage and delivered a fine performance teasing the crowd with their mighty riffs and surging the whole room with their perfect blend of chaos and melody. Those who understand the music of Wodensthrone will know that they are a respectable underground black metal contribution that has delivered timeless albums through the years and as they finished their set, you were left utterly in awe of the music and completely satisfied at the magically delivered songs. Good work guys! It's no so often you come across a band that sends shivers down your spine due to the massive sound, an entrancement of such epic and yet droning sounds that hit your entire body and almost in a dreamlike state you watch and are automatically engaged with what a band like Esoteric can offer. The band itself has released many albums and to witness tracks being delivered so perfectly live was an absolute honor. Esoteric bring out the patterns of melody yet the crushing atmospheric/funeral doom you can possibly imagine. Their impact live is what struck me like in tracks such as "Circle" where beauty, depth, sadness and darkness are fused together entwined to create an ambiance like no other. Esoteric are quite easily one of the best underground doom bands around. All in all, a Sunday evening was made 100 times better for putting on this show. Absolutely stunning live sets from all bands. A thoroughly enjoyable evening with the best contenders in the underground music scene. 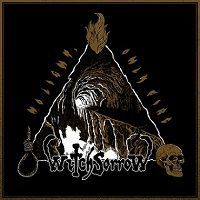 WITCHSORROW have, over the course of their ten year history, become one of the worst kept secrets of the UK underground. The Hampshire based trio have, off of the back of a demo, an EP and two excellent full length records, managed to garner a reputation for celebrating the slower, heavier side of Metals more extreme corners. Their last album, "God Curse Us", has helped to bring the band widespread attention and critical acclaim, all of which they thoroughly deserved. Indeed, it's one of the records that helped usher me into the world of Doom Metal upon its release three years ago. Their latest record, "No Light, Only Fire" shows a slight but noticeable change of musical direction which might just solidify the bands status within the scene, sticking them on a par with some of the biggest contemporary Doom acts. Right off the bat, it's clear that this is a much different record from "God Curse Us". Whereas the songs on the previous record were much slower and atmospheric, the opening offering on here, "There Is No Light, There Is Only Fire", is much more aggressive and up tempo. 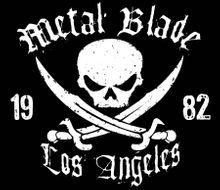 This is still clearly the band that gave us "Witchsorrow" and "God Curse Us", but they sound re-invigorated. Built around a fast, heavy riff, and tight, rhythmic drumming, this is perhaps the best song on which to begin this opus, with catchy guitar lines that command your attention and raise your expectations sky high for what's coming next. "The Martyr" finds the band on much more familiar territory, being much slower than the preceding song and sounding absolutely monolithic. The thick, tar-like bass line that opens this behemoth of a track sounds amazing and really sets the musical tone for the rest of the song. This song is full of the sort of powerful , Sabbath-esque riffs that fans have come to expect from the band. Towards the end, the pace shifts up a gear, and we're treated to some more riffs that are inspired and interesting, and it's this which brings the song to a close. The albums third offering, "Made of the Void", has a razor sharp edge to it, which makes the music on display here sound even bigger than it already is. It's a really solid track with lots of cool musical ideas that are all amazing, especially when it comes to the guitar lines, which draw the listener in and maintains their attention throughout. "Negative Utopia" is, put pure and simply, classic Doom; it's got some slow, dark riffs, juggernaut drumming and some really killer vocals that all really complement each other. It's also got a really gnarly, imaginative solo that really helps turn this from a good track to a great one. The palpable, brooding riffs on here sound immense "To The Gallows" takes a sombre turn, giving us some dark, almost Black Metal tinged guitar lines that are hair-raisingly good. This entirely new element in the sound does not come off as out of place at all, and helps make this one of the more memorable tracks on the whole record. This is one of those songs that has a quality about it which marks it out as a future fan favourite and potential genre classic. "Disaster Reality", the second to last full length track on the record, blends minimalist guitar lines with much thicker, chunkier bass and guitar parts, to great effect. This really is a slow burning track, which gradually gains momentum as it progresses, becoming one of the albums highlights by its closing notes. "Four Candles", a short, instrumental piece, brings another element to this record that we haven't heard from the band previously; acoustic guitar parts. At only a minute long, this acts as a great prelude to the albums closing gambit, "De Mysteriis Doom Sabbathas", a song that originally appeared on an EP of the same name in 2013. At just shy of fifteen minutes long, this is the longest track on the record by a stretch, and it's safe to say that there isn't a dull moment within this track. Crawling forward at a funeral dirge, this track really brings the record to a close in style; there's just as many hooks in the delivery of the vocal lines as there are within the bass and guitar sections. It's an epic, towering track steeped in distortion and thick, pounding rhythm sections, and some of the coolest riffs on the record can be found within this song. It's a great close to what is arguably this bands magnum opus. I went into this record sure that WITCHSORROW were not going to be able to top their previous full length. I thought, at the very least, that it would be immensely hard to surpass the lofty standards that "God Curse Us" set for them. However, by the time the last notes on this record died out, I was left both impressed and amazed by just how much of a step forward this record is for the band, and how, in the space of three years, the band have managed to iron out the majority of their weaker points and replace them with some newer aspects that not only make them sound better than they did before ( if such a thing was possible), but also add a unique flavour to the songs that will make it stand head and shoulders above most other Doom Metal releases you'll hear this year. I'd thoroughly recommend this, and indeed all of their back catalogue, to practically anyone who loves Doom and killer riffs. The Black Metal scene in the UK has, for the last couple of years or so, begun to go through a bit of a renaissance. Small scenes have been springing up across the nation and producing some awesome bands, all of whom have their own distinct styles and cover Black Metal in all its various forms, from the Symphonic leanings of bands like ETHEREAL through to the rawer, more bestial forms exhibited by bands like AVULSION RUPTURE and GOATCHRIST. One of the places that has produced some of the best music to be found the Black Metal underground is Cumbria. With it's rural setting and relative isolation from many of the largest northern cities like Manchester and Leeds, which themselves have given us some great bands, it not surprising that some of the most powerful and unique Black Metal is coming from this region. Millom based ULFARR are one of the bands that are starting to take the underground by storm, solely off the back of three demos, a split with HRAFNBLOD and two live records. Their third demo, "Blackwood", is the release on which they managed to gain some wider attention and garner a bigger, more rabid fan base. This is a demo that will appeal to fans of raw, sepulchral Black Metal, and it's one that I think anyone following the burgeoning Black Metal scene in the UK at the moment should hear. That is, if you haven't been lucky enough to hear it already. The opening offering on this EP, "Trois Morts Et Des Trois Vifs", is a strong, confidently played, mid-paced track with thick rhythms and cold, eerie leads. This has an incredibly raw sound, which really adds to the feel of the track. The vocals, when htey kick in, although at points barely audible, cut through the cacophony of sounds and are well placed. "The Chained Oak" is definitely one of the best tracks on this demo, with dissonant, dirging riffs and powerful, methodical drumming that is mesmerising. Towards the middle of the track, the song shifts gears, becoming much more ferocious and speed driven, with some really good lead hooks in it that help cement this track as one of the best on here. The music eventually dies down, and it's time for the third tune on here; "Atra Mors". This is another mid-paced, dark song with a great, raw sound and some excellent guitar lines that help draw the listener in. This demos final, titular track, with its icy, tremolo picked intro, and incredibly atmospheric leads, is a suitably cool end to a great record. This is a very solid demo that showcases a band with a lot of great musical ideas and will likely be the basis of not only a great live set, but also a productive and interesting life as a recording band. They've been making waves at the few live shows they have done, and will be opening for OLD CORPSE ROAD in Bridlington on September 5th. If you get a chance to see them live, or indeed check out their music, do so; if you love Raw Black Metal, you certainly won't be disappointed. SLOW WORM - "THE INVERSE ASCENT"
SLOW WORM - BUY NOW! Doom Metal is a great kind of music to use as a base on which to build experimental sounds and styles. As many bands have proven, it can work well alongside Black and Death Metal, and it can indeed work well when done with other forms of music. One band that illustrate this well is Leicester based Doom/Shoegaze act SLOW WORM, who've been playing heavy Doom, layered with atmospheric sounds and lighter guitars, since their formation in 2011. 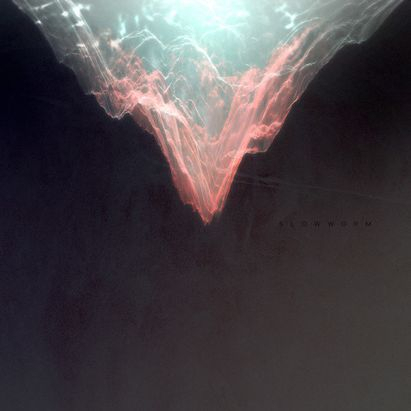 After putting out two demos, they've finally released their debut album, "The Inverse Ascent". 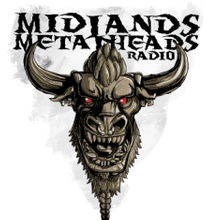 Featuring four songs that last, combined, almost forty minutes, this is an album that might just bring them national attention, and carve out their name on the wider Metal scene. The albums opening effort, "Crypt of the Vultures", comes out of the speakers at a crawl, with thick, tar-like guitar and Bass lines, punctuated by powerful drumming that helps to really make the riffs seem even bigger than they already are. The whole track is cloaked in a noticeable atmosphere, and the haunting vocals on this one really make the track. The vocal range on this goes from really good clean parts to a harsh rasp, and it's clear that Alan is a brilliant vocalist. At just shy of ten minutes, this is a great way to start the album. The following track, "Farther", is very much the same, with heavy, dirge-like riffs contrasted by eerie, clean vocals. About half way through the track, the music dies away, and slowly builds back up as a serene shoe-gaze piece that sounds awesome. It never reaches the same levels of heaviness that made up the first half of the song, but there are points where it seems as if it might. It's a great way of creating tension and keeping the listener on the edge of their seat. "Ego Twin Chrysalis" sees the band begin to make use of their atmospheric aspects a bit more, and they work very well, with some nice drum work and cool vocals. The song eventually gets heavier, and has a very classic Doom Metal vibe to it, while of course having that palpable atmosphere surrounding the riffs. Again, the Shoe-gaze influences start to come to the fore, and they work very well alongside the Doom and the atmospherics. This song ebbs and flows, and it manages to captivate the listener throughout, a hard task when you consider this song is close to fifteen minutes in length. The Psychedelic inflected guitar solo on this one goes down really well, and sounds absolutely awesome. The final song, "Where I Creep, the Light is Shy", is genuinely quite a powerful track; it consists of a long, creepy piece of Ambient music that really sets you on edge at points. It is genuinely hair-raising at points, and it works perfectly as a way to close this great album. This is a very solid debut album that hopefully will mark the beginning of a long and successful recording career for these guys. I haven't seen Doom and atmospheric music blended this well since I stumbled across SPACE WITCH a few years back, and trust me, that is no small compliment. This band are great at what they do, and with any luck, a lot more people than myself will grow to appreciate this fact after listening to this record. I highly recommend this. Unless you've been living under a rock for the last few years, if you like Extreme Metal, you will be fully aware that Black Metal has begun to experience a resurgence in this country. And as is the case with most Black Metal the world over, some of the best bands are emerging from the dark, cold and eerie North, namely places like Yorkshire and Cumbria. With "From Moonrise to Moonset", two of the best Black Metal acts that the UK underground has to offer have joined forces for a split which showcases what fans can expect from music from these areas. The two bands in question, Cumbria based TORVER and ARCANE NORTH of County Durham, both play heavily atmospheric Black Metal, but both approach it very differently, each time producing some awesome music. 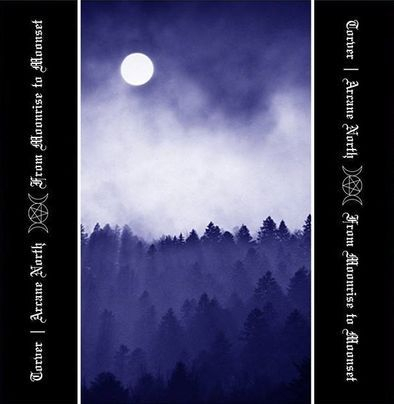 The opening track on the TORVER side of the split is "Moonrise", a very cool Ambient piece in the vein of bands like HECATE ENTHRONED and early CRADLE OF FILTH. It really helps to build a powerful atmosphere immediately on this record, and really helps to set the tone for the awesome music that is to come. It's quickly followed by "Naked in the Wilderness" has a very strong opening part, cloaked in atmospherics and completely made by the chanted vocals within it. Chanted vocals work very well with Black Metal, and unfortunately very few bands ever really use them in their music; Thankfully, TORVER are one of these few. When the song kicks in properly, we're treated to a raw Black Metal song which makes heavy use of Keyboards to great effect, along with plenty of those great, chanting vocals. 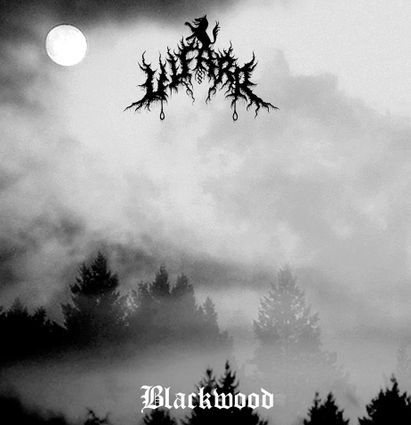 The final part of their portion of this album comes in the form of "Lunar Ritual", another very atmospheric, powerful song backed by a harsh, Black Metal rasp. Most of the hooks on this song come from the keyboard sections, and they sound amazing. Many bands have a tendency to place either too much or too little emphasis on keyboard pieces in their music, but TORVER manage to get the balance just right; not too much to be over-bearing and in your face, but just about enough to you're aware of it and appreciate it. Metal acts like HECATE ENTHRONED, ARCANE NORTH can be described in the same breath as bands like SUMMONING. The keyboard sections in this song are mighty and compelling, and are counter-pointed perfectly by the grim and coarse Black Metal that hangs over the whole of the track. Some of the lead guitar lines are mournful and hair-raisingly good. The following track, "Cold Lonely Moors" is a cold, eerie and atmospheric track with some genuinely awesome vocals. At some points in this song, the music sounds completely immense, and manages to blend Ambient and Black Metal together perfectly. This track is absolutely monolithic, spanning almost twelve minutes, and definitely manages to get a lot of great hooks and elements into it in that time. And then it's time for the final track on this split, the one that brings this whole release full circle; "Moonset". This is more of an instrumental, Ambient affair, and considering that this is what the album opened on, it's also a really great place to end it on. This is an extremely solid split from two really great bands, both of whom I feel have a lot of great music to give us in the future. All the songs were fantastic, and both bands managed to get the balance between the Black Metal and the Ambient in their sounds just right. This is one of the most impressive Black Metal splits I've heard in a while, and I can't wait to see what both of these bands have got coming next. I would highly recommend buying this album to anybody who likes Ambient Black Metal. I'd also highly recommend checking out both TORVER and ARCANE NORTH, as they are both excellent bands in their own right.